I was really looking forward to getting back on the river and all the signs were good after some of the guys had been down swim clearing and reported seeing loads of fish. 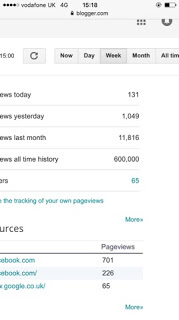 Some other good news in the week as well when the blog went past 600,000 hits, thank you so much for all your support and great feedback, I really do appreciate it. 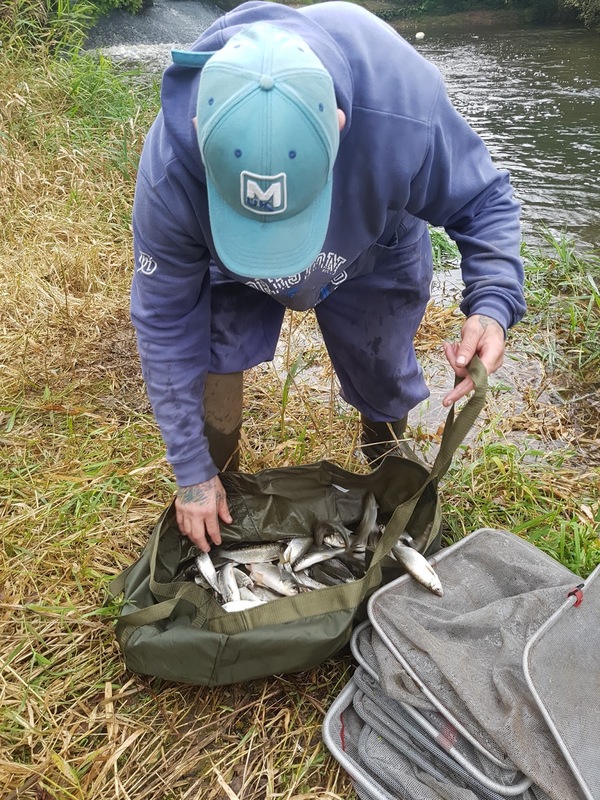 We had quite a bit of rain mid week which would hopefully put some much needed colour in the river and with 14 booked in, Hurf was going to use Upper and Lower Coxes and Isle Brewers. Several of us met for breakfast at the Little Chef and it was great to see Paul Homewood and Terry ‘The Toast’ Morgan fishing today, looking at the pegs, I made a mental list of the ones I fancied, 14, 15, 27, 120, 124a and 125 so nearly a 50:50 chance of drawing where I wanted! After everybody had finished we headed to Upper Coxes to do the draw, Adie went in the bucket first and pulled out 14 so that only left five of my preferred options, by the time I went in, there were only two balls left. I pulled out one and slowly opened my fingers, I could see the first number was a 2 so I wasn’t at Isle Brewers, I revealed the second number and it was an 8 which put me on the ‘Big Bend’ in the copse. 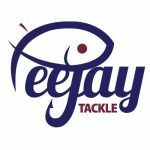 It used to be a great peg but in recent times, it’s been a struggle and hasn’t been used much, the last time it was in, Hurf blanked and I had one minnow from peg 29. 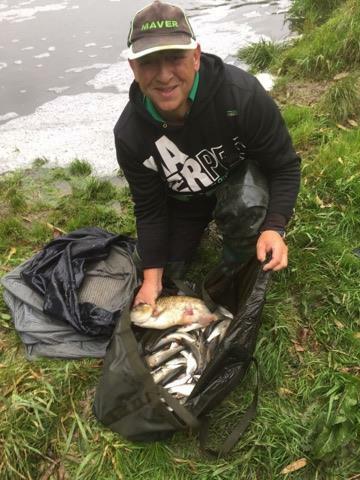 But we have to give them a go and peg 27 has been throwing up some decent catches and young Stuart Aplin was on it today. As for the other pegs on my wish list, Rob was on 15, Fieldy had drawn the fancied peg 120, John Dursley was on 124a and Jake was on 125. After a short drive I parked up by the copse and showed Stu where his peg was before heading to my peg, it looked nice with lots of cover opposite and in the tail of the swim, I got my box low to the water and was quite surprised how clear it was, given the rain we’d had but the river doesn’t hold colour for long these days. I set up a 1 gram Drennan Tipo to fish the deep water and a 0.6 gram DH16 for shallower water in the tail, both had size 18 B611’s to 0.10mm. On the side tray I had the usual maggots, casters and Bait-Tech Super Seed Hemp. 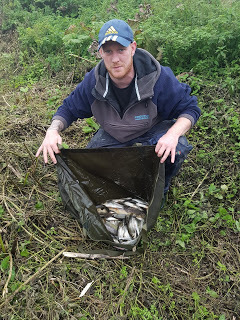 The allotted start time of 10:30 arrived and I kicked off with a single maggot on the lighter rig and it wasn’t long before I had a minnow in the net and that was enough of that! 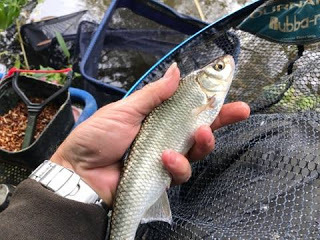 I switched to caster and was expecting to catch quite quickly but never had a bite, after about ten minutes I did catch a small chublet which was on when I moved the rig! Next I tried the deep rig at ten metres, just short of the tree in the middle of the photo above and finally started getting bites, I had a couple of small dace before catching a slightly better chublet of 4oz or so and then had a lovely dace followed by a decent roach and I was really enjoying myself. 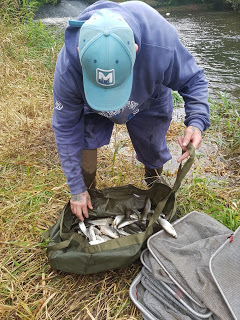 As the first hour came to a close I had eleven fish for around 1.5lb and if I could carry on like this, 9-10lb would be on the cards which I thought might be a decent weight today. Bites slowed up going into the second hour and I added a section to fish right across but the flow was all over the shop and I just couldn’t get the rig to hold back or run through any sense and I only added another six fish. 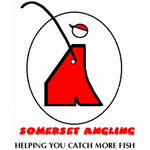 Hurf phoned and said the same, he’d caught well to start with before bites slowed up, he also said Paul Homewood had got to his peg and fallen in! 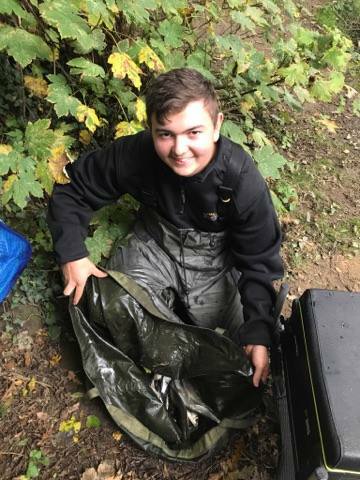 Fair play to Paul though, he took off his wet clothes, dried himself off and fished wearing just his waterproofs and a spare hoodie he had in his car. I did manage two more chublets from tight across but as the half way point arrived, bites were becoming less and less frequent. I’d been feeding the tail of the swim from the start so picked up the shallower rig again, I missed a couple of quick bites before that died a death as well. 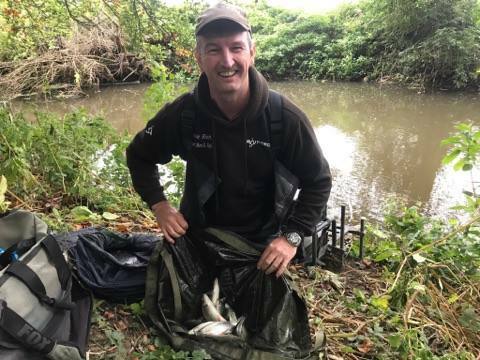 I stuck some more sections on and went tight to the far bank at 13 metres, I had a decent bite but on the strike a minnow flew out of the water and fell off! Next chuck I had a tiny little chublet of about quarter of an ounce and decided to have one more go over there before trying somewhere else, the float buried and this time the strike was met with some resistance and I gently shipped back before netting another good dace. Over the next hour or so I had a few more but they wouldn’t settle and I’d get a couple before having to try somewhere else. 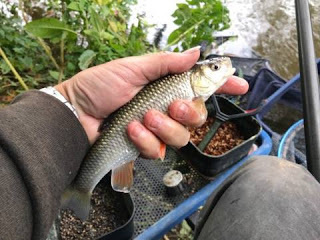 I was still feeding to my right as well and with about an hour left I had another go with the deep rig, I didn’t really get the response I’d hoped for and with no bites after ten minutes, I was just about to give it up as a bad job when the float shot under and I had another chublet. Next chuck the rig had barely settled before the float slid away and this felt like a better fish, I was shipping back carefully and the fish was making some darting runs and pulling a fair bit of blue hydro out and I was sure I’d hooked a decent trout and as they count in our matches, it would be a handy bonus. Then it all went slack and the hooklength had gone and I think it had bitten me off! 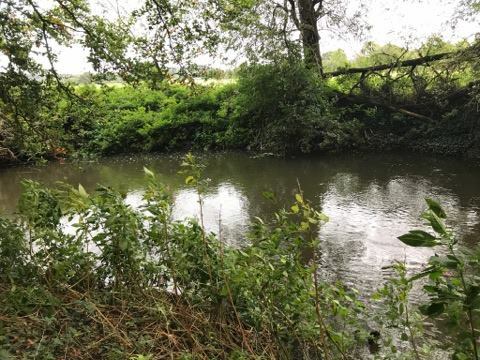 I tied another hooklength on but that was the last of the action there, for the last hour I fished tight across with the shallower rig and managed a couple more fish and lost another dace before the end of the match arrived. I was gutted about that trout and I hoped it wasn’t going to cost me. I’d nearly finished packing up when Stu arrived with the scales, he said he’d caught a few and enjoyed himself but had bumped several as well. 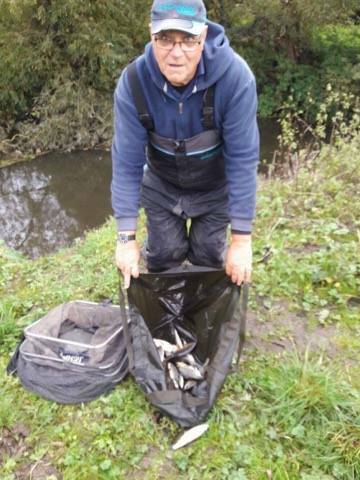 I stuck my 27 fish on the scales and he called it at 4lb 7oz which was a little more than I thought but should have been nearer 6lb! We walked up to weigh Stu and he had a level 2lb. 4lb 7oz and quite an enjoyable day but a long way off the pace! Then it was back to Upper Coxes for the results, Adie had 10lb 3oz from 14 but had caught most of that in the first couple of hours, Leighton did really well to weigh 8lb 15oz from new peg 22a, Rob had 4lb 10oz from 15 and Tony Newman didn’t weigh in peg 17, so I was well down in my section already and there was still Fieldy to come and I was sure he’d beat me from 120. 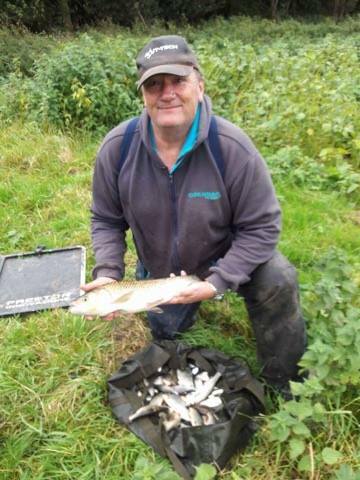 Sure enough, as the lads started coming back from Isle Brewers, it had fished really well with Graham leading the way with a brilliant 21lb 10oz, he’d fished his normal three sections to hand and had caught loads of small fish and added a 3lb chub for good measure. Thanks to Jake Woodard* and Rob Cox** for the photos. 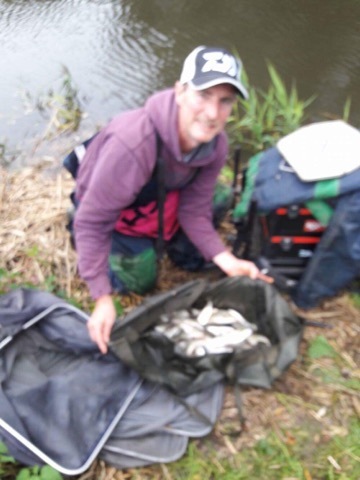 Paul Homewood had made the right decision to stay and fish as he had 15lb 6oz which included a 3lb chub and some nice roach, he’d lost a chub as well, Jake Woodard was third with 12lb 8oz of quality roach from 125 followed by John Dursley with 10lb 12oz from 124a, Karl had 6lb 9oz from 123, Bill had 6lb 2oz from 126, Terry weighed 5lb 13oz from 124, Hurf had 5lb 7oz from 129 and lost a big chub but still took a pound off me and I had to give one to Karl as well. 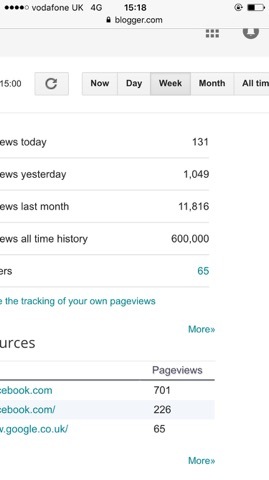 Thanks to Steve Hurford*** for the photos. So a great start to the river matches with double figures needed to get in the money and I was spot on with my wish list as four of the top five came from my fancied pegs, not such a great start to my winter league campaign though with a lowly five points out of seven but I’m looking forward to the next one already.